Photo by Sebastian Kim. Fash. Ed. : Andreas Kokkino. Adam Ballheim, Jean Hall and Guillaume Harrison. FCS and Gorilla would like to officially welcome Curren Caples and Shane Borland to the team. Both will be exclusively riding FCS fins and accessories as well as Gorilla traction. Curren (14) and Shane (11) are both known for their talents skateboarding but have become extremely talented and competitive surfers over the past few years. Curren has always had surfing as a close second to skateboarding; his father a former pro surfer and surf shop owner. And Shane is currently ranked 14th in the NSSA in his age division. Here's what the guys had to say about their new sponsorship. "I'm hoping that being sponsored by FCS and Gorilla will help me become one of the best free surfers in the world. I'm always competing in skating; sometimes there's a lot of pressure. Surfing is my release, a way of expressing myself, and it's a ton of fun," said Caples. What inspires you to skate? Curren Caples:I’m not sure what inspires me. I just feel the need to skate. Who do you skate with? Curren Caples:Louie Lopez (Goldie), Jake Anderson and anyone that calls. If you could go on a skate trip anywhere in the world, where would you go? Curren Caples:I would want to go to China with the Flip guys. Name two things that are lame: Curren Caples:People that chew loudly and my reaction to people that chew loudly. Name two things that you love: Curren Caples:My family and traveling with friends. Things you wish you could do on skateboard: Curren Caples:Every single flip trick that seems so hard for me right now. Last Words: Curren Caples:I have made really good friends and traveled to amazing places. I have gotten to do so many things that I never would have experienced if I was not a skateboarder. 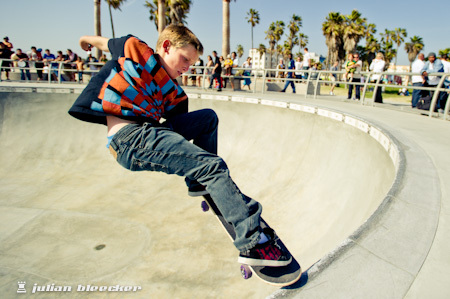 Shane Borland at Venice Skatepark. Photo Julian Bleecker. ﻿Shane Borland, at the young age of 10 years old, is a two sport anomaly. From a really young age Shane took to both skating and surfing easily. Garnering interest from sponsors, tv producers and the media, Shane has matured into quite an athlete. Still young, Shane has been competing actively in both surfing (NSSA ranked #9 in 10 and under) and skating. Here is what Shane Borland had to say: ﻿ "Whether I'm surfing or skating I know I have to be riding on the best equipment. Everybody knows that FCS has the best fins. Also this opportunity to be on the team will give me a chance to try out different fin designs to better my performance even more," said Borland. FCS and Gorilla are always exploring new avenues in; design, innovation and sponsorship. 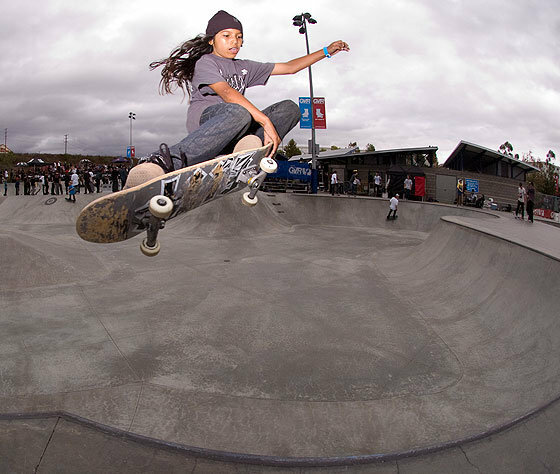 By looking outside the surf scene and into skate we hope these new riders will help lead our brands in the right direction and we are extremely excited to see what these young athletes have in store for us. Shane also just signed with Powell-Peralta last Nov 20th, so it's rtaher a godd end of the year for him. By the same token, Louie Lopez, on the left, has just committed to a 2 year deal to continue his tenure with clothing sponsor Volcom. Having spent most of his young life supported by the Stone, Louie is stoked to continue the relationship leading up to his pro career.